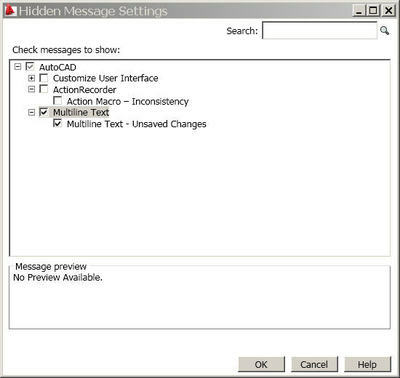 An AutoCAD Hip Tip on Hidden Messages and a new MTEXT Feature! Many years ago I had the privilege of meeting a wonderful AutoCAD user by the name of Alan Dunn from Atlanta, Georgia. Alan was the creator of the CAD Card, slide charts for AutoCAD. I remember back in my teaching days highly recommending these to my students as they put so much valuable information in one location (and eliminated the need for a calculator to figure out all those pesky scales). Sadly, Alan passed away much too early in life, but his widow, Susan, has kept the CAD Card going. She just informed me that there are two new Metric CAD Cards available so be sure to check it out! Over the years AutoCAD has included a variety of messages to help the user along. In most cases, you have the opportunity to tell AutoCAD to turn off said messages when they start to annoy you. But what if you turned off one of those messages and wanted to bring it back? Or what if you are a CAD manager and one of your users has turned them off (and really shouldn't have!). AutoCAD 2009 has finally provided a low stress means of bringing back those messages (which we will get to momentarily). Segue: We have all learned the hard way what happens when you hit the Escape key while in MTEXT, you lose all your hard earned text. You must gracefully exit the MTEXT editor - by doing a Ctrl+enter, hitting OK, or by picking anywhere outside the box (I just threw in a bonus tip there). Thankfully, AutoCAD 2009 provides a nice net for those of us who are tired of losing our text. Now when you hit an escape while in MTEXT, the following dialog will appear. But what if you like it the old way where an escape cancels out of the box? What if you understand that you will lose all the changes? No problem - you can check "Always perform my current choice" and select the "No" button and you'll be back to pre-AutoCAD 2009 behavior. Now let me remind you that "Always" is a pretty strong word. It is right up there with "Never". What if after the fact you choose to change your mind? How do you get the dialog back? No problem - Simply go to the System tab in OPTIONS as seen below and you'll find a new button for controlling Hidden Messages. That will take you to the below dialog where you will find all those messages you've turned off - a simple click can turn them all back on or you can turn them on individually. I'm off to work on my presentations for AU China (yes...there is an AU in China! )...Have a great Wednesday!